I stumbled upon this book via Hans Georg Huber's Twitter channel, Coachingbuero, where he collects links to articles on leadership, management and corporate culture. Although I generally dislike it if people unknown to me suddently start following my Twitter profile (there is a taste of spam to it), in this case it was helpful, and I absolutely recommend Coachingbuero. 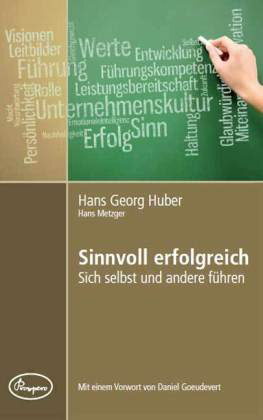 The book "Sinnvoll erfolgreich" is a result of the authors' professional life: Both are consultants, they coach managers and leaders, and act as intermediaries between people and companies. The book is divided into three parts. The first one deals with becoming a leader in your own life, the authors argue that change always begins with oneself. It's about harmonizing one's being and acting, or in other words, inner and outer success. Outer success is basically making a living, and it is necessary in order to achieve inner success, which is creating something which is meaningful to yourself. Someone who lives according to these values would not follow others just for the sake of following, as it would deeply disrupt the balance. The middle segment is about inspiring people to work in a company. The crucial point here is that the company and the employees are a base for each other's success, again an issue of finding the right balance. If only the companies' success is important, employees will leave and in the long run, the company dies. So it's essential for a company to have values, and even more, to act according to these values. Only then can employees identify with them as if they were their own. With these values, a company becomes meaningful, and give its employees' actions meaning as well. The last part deals with becoming a leader in the company context. In today's economy it's not really leading in the traditional sense, more like moderating change processes. It's their job to create win-win situations between employees, clients and the company itself, over and over again. The challenge for a leader is to remain authentic and real, which has been described in part one of the book. I especially liked a Chinese saying quoted here, "When winds of change blow, some build walls, others build windmills", and of course we should strive for the latter. All in all, this book carries an important message, but somehow it sounded all too familiar, and it missed some big bang. Maybe it's because it is written by Germans, and not Americans, who have a way in simplifying and focussing that others rarely possess. So while I recommend the book, and it's a quick read and a rewarding experience in general, it didn't direct me to something really new. But it's a welcome reminder, which will prove to be helpful in day-to-day life.